It’s what defined “craft beer” from “macro” for a long time—craft in glass bottles, big beer in cans. Canning has become cheaper and lighter, but, more importantly, there have been improvements in canning technology so the beer doesn’t react to the can, producing off-flavors. These developments didn’t go unnoticed by small breweries wishing to cut costs while preserving the taste of their crafted brew. By switching to cans, breweries achieve greater penetration into beach venues and sporting arenas that don’t want the waste and hazards of glass bottles. Canning is increasing within Long Island’s breweries, some having made the leap, with more planning to jump to aluminum. 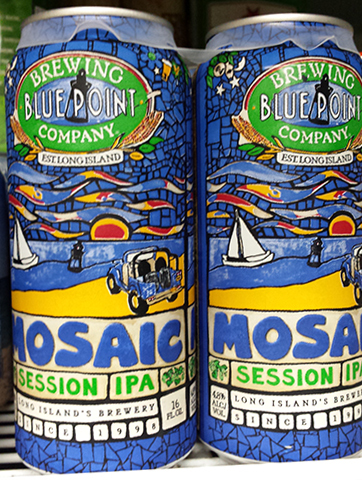 No surprise that being one of the elder statesmen of breweries on LI, Blue Point was one of the first to start canning in 2012. 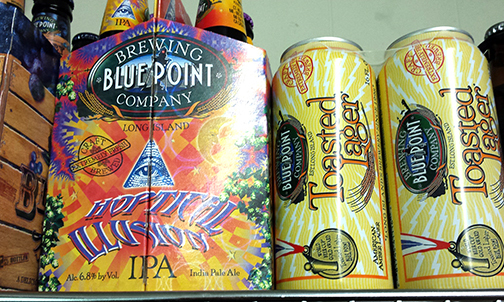 Blue Point’s canned beer includes its flagship Toasted Lager, the popular Summer Ale, White IPA, and Toxic Sludge, and most recently Rastafa Rye Ale and Mosaic Session IPA. This brewery at the end of Long Island’s South Fork began canning in 2014. Now, you can find its beers all over the Island, even at impressive venues like Citi Field. 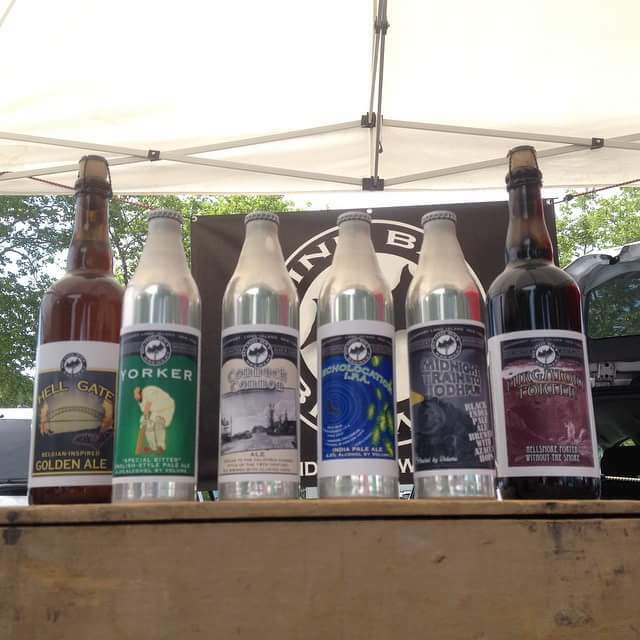 Its lineup includes Driftwood Ale, Summer Ale, and Session IPA. 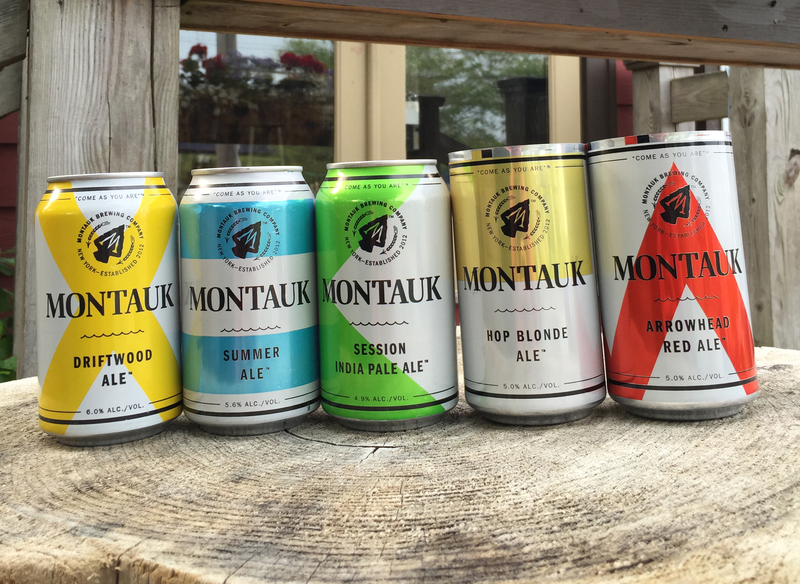 Montauk Brewing is also releasing Hop Blonde Ale, a 5% ABV, hoppy American blonde ale made with Nugget and Ahtanum hops in the beginning of September, and Arrowhead Red Ale, a 5% ABV, Irish red ale, which will be released by the end of the year. 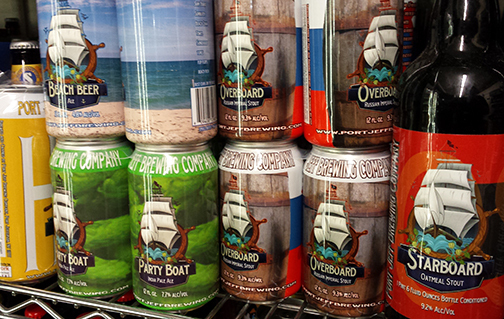 Port Jeff first canned its Party Boat Session IPA, and it was an immediate success. Never one to be ordinary, Port Jeff began canning four-packs of their H3 Trippel, a Belgian-style ale, and Overboard, a Russian Imperial stout in 2015. In June, Beach Beer, a Belgian-style wheat beer, was also added. 2015 was the Year of the Can for GSB and its Field 5 Golden IPA. It also introduced Long Island to the “Crowler,” a 32oz. 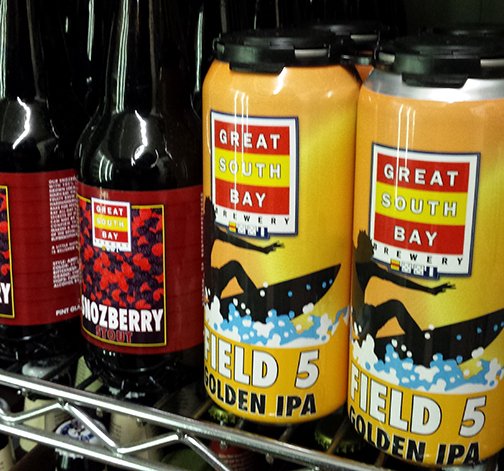 can filled to order in GSB’s tasting room with any choice of beers on tap. Personally, I want to see its popular Blonde Ambition American Blonde Ale and Blood Orange Pale Ale in six pack. I can only hope. Blind Bat has been appearing at farmers markets with something shiny and new. Instead of cans, its using aluminum bottles. Some of the new bottles are Commack Common Ale, Echolocation IPA, Midnight Train to Jodhpur, an American black ale, and Yorker Special Bitter. Barrage is looking to release two of its beers in cans before year’s end. First, will be their American IPA Galaxy Beast. Initially the cans will only be available for sale at the tasting room, so don’t look for them at your local distributor… yet. NB: Photos taken at Bellport Cold Beer and Soda in Bellport, New York, except for Montauk Brewing Company and Blind Bat Brewery which were provided by the breweries. Cans can ship easier and are used exclusively at venues to avoid the hazards of glass, however I’m still not a fan until they line the cans with something other than BPA. However, if you are drinking beer you are probably not doing it for your health and now you may be able to have access to more of your favorite craft beers. So that’s a plus. Isn’t all draught beer essentially a giant can of beer? Are kegs also coated with BPA? Not being a jerk, just wondering? From some research, kegs are either stainless steel or use plastic that don’t need BPA as a liner. Older kegs can be made from aluminum, though they are very rare. I do not know a date of when brewers changed from aluminum to stainless steel or if they ever used BPA in aluminum kegs at all.